Registration is open for the Colors of Love: Raising Children in a Racially Unjust World training event coming up on Saturday, August 25, 2018. 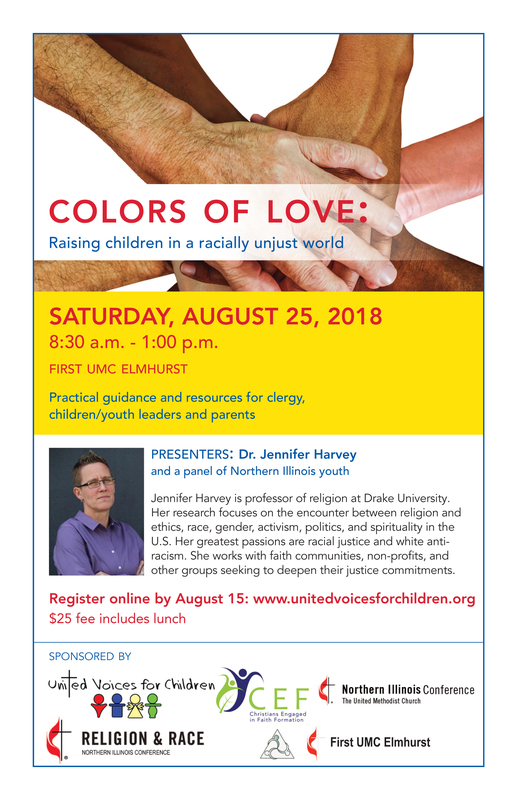 Colors of Love will present practical guidance and resources for clergy, leaders of children & youth and parents featuring Dr. Jennifer Harvey and a panel of Northern Illinois youth. Dr. Harvey is professor of religion at Drake University whose research addresses the encounter between religion and ethics, race, gender, activism, politics and spirituality in the U.S. Colors of Love will be on Saturday, August 25, from 8:30 a.m. to 1:00 p.m. at First UMC in Elmhurst, Illinois. Register by August 22nd at this link. After that date, call 773-316-8892 to ensure space available. The $25 fee includes lunch. The first 20 persons to register will receive a free copy of Dr. Jennifer Harvey’s most recent book, Raising White Kids: Bringing Up Children in a Racially Unjust America. Others can purchase a copy of Raising White Kids from UVC for $18, including shipping. Place your order at: unitedvoicesforchildren@gmail.com. Colors of Love is co-sponsored by United Voices for Children, First UMC Elmhurst, Northern Illinois Commission on Religion and Race, the Christian Educators Fellowship Chapter and the Northern Illinois Conference of The United Methodist Church.